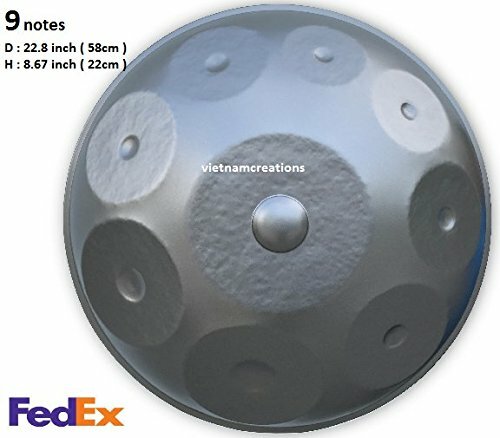 Find the best hang drum to recommend? Now there’s a mission we can get into. 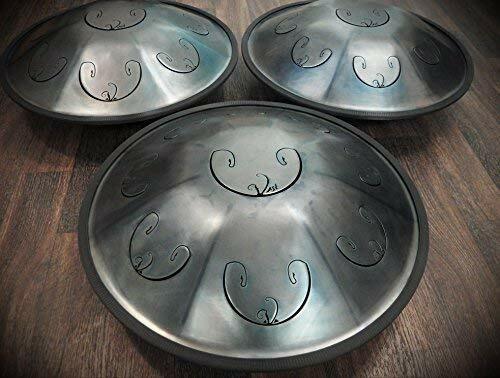 Hang drums (or hangs, or handpans) are newcomers to the world of percussion instruments, having been around for less than 20 years. We can honestly say that when we first heard one played, it blew our collective mind! The rich sound, with rhythmic taps combined with overtones vibrating together to produce lush chords, really sets this instrument apart. It’s part drum, part xylophone, and part voice of god! From simple beginnings with only one maker to now several hundred designs of similar size and weight, how do you choose the best one for you? Top-end hang drums can cost as much as $10,000 and take over a year to be custom made for serious professionals. However, in this review, we take a look at the 5 best hang drums for quality, value, and overall playing experience. So, What’s The Very Best Hang Drum? When this hang drum arrived from Indonesia smartly packed in a wooden crate, inside its own soft protective backpack case, we were super-excited. The story behind this hang drum is that a musician traveled to Bali and started making steel pans with local Balinese musicians. Once they had perfected their skills on oil barrels, they decided to try making hang drums. The results speak for themselves. The manufacturer of this hang drum offers an incredible opportunity – to choose the scale you want for your own instrument. We tried out a hang drum in E major, which is quite a versatile scale with a nice, deep E3 as the ding (that’s the central tone, but more on that later). Our studio was instantly filled with a full, rich sound like a miniature orchestra. Compared to other hang drums, this one had less of a “ping” and more of a “pong” sound to it. Striking each tone area also pulled out 2-4 overtones, plenty of sound to fill the room. To us, this instrument had a distinctive sound. 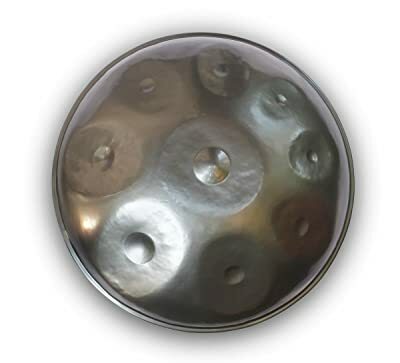 The tones of the Bali Steel Pan are bright and full, with a fast envelope, even the highest notes. I was instantly reminded of classic gamelan music, ringing with gongs but less muddy and with nice clear tones. A beautiful hand-made rustic look. Very basic carrying case not well-suited to the instrument’s price. After being mesmerized by a magical hang drum, we had the opportunity to be tantalized by a tongue. No, it’s not what you’re thinking! Tongue drums have “keys” cut out of the steel shell. These are usually struck with mallets and ring to single, true tones. But with the RAV2 Tongue Handpan, we were in for a big surprise. This drum isn’t hammered into indented tone fields like a normal hang. Instead, it’s cut into tongues, which are each then cut into smaller keys with beautiful, intricate patterns. This automatically creates heavenly ringing overtones on each tongue. We heard up to 7 tones on the ding! When you strike the tongues in different places, you’re able to isolate certain overtones while muting others. That’s what makes this beautiful instrument rich and full of color, and that’s why we’ve included it on our list, even though it’s not a true hang drum. It does, however, make this instrument a bit harder to play. Differences come through, but it’s up to your ear to decide whether they are positive or negative. This instrument rings a lot. It had the fullest sound of all the drums and was by far the loudest. While true hang drums had a lot more dynamic range, the RAV2 stands out boldly, singing outdoors or in a large acoustic space. Full of overtones that can be controlled. Different sound and harder to master than a true hang drum. The rubber ring around the drum might not last long. 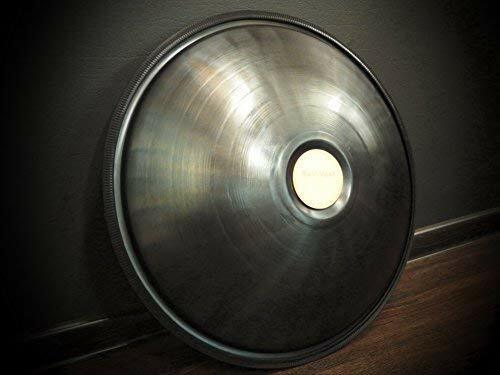 This hang drum arrived at our studio shiny and black, with an almost iridescent sheen on it. According to the manufacturer, the colors of the heat-treated steel vary by instrument, and ours luckily came out looking fantastic. This was the most expensive of the hang drums we tried, but we think it looked the part. The overall resonances of the instrument were in great balance and really brought out the mystical feel of the Akebono scale it was tuned to. This is essentially a Japanese pentatonic scale, and to most ears sounds very eastern. One issue was the precision of the tones. Checked with our own tuner, 2 of the 8 tones were a bit off. However, when played by itself the instrument sounded fantastic and in tune. This may be a larger compromise – in order to get an overall perfect sound; some tones may have to be slightly detuned. So this hang drum sounded great but may be hard to use in accompaniment with other precisely tuned instruments. On its own, the bright sound of this hang drum combined with the Akebono scale would make it a fantastic instrument to accompany meditation or provide a mystical ambiance. Most expensive in this rundown. A few notes seem to be intentionally detuned for overall tone consistency. 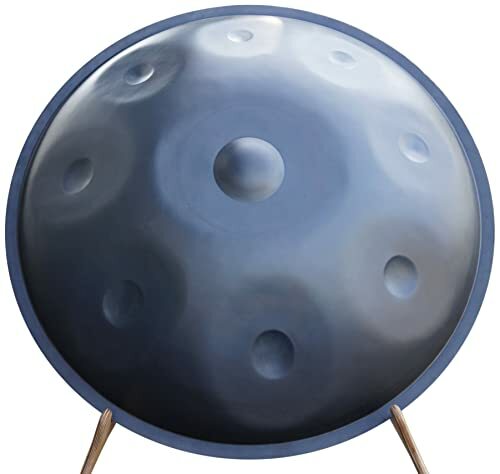 Next on our list came the most affordably-priced hang drum that we checked out. This one came from Vietnam, which probably accounts for the low price. It was delivered with a very cool backpack case that was obviously designed by someone who has carted drum equipment around to gigs before! What was it like out of its case? The first thing we noticed in comparison to the other hang drums we tried out was the evenness of the construction. While some drums were lumpy and organic-looking, this one had tone areas that were flatter and smoother. And the look seems to have dictated the sound. We found the tuning of the main tones in each area to be very precise. All of them were bang on with our tuner. When struck centrally, each tone area came across clearly and brightly. Around the rims of the areas and on shoulders, however, we found this drum to have significantly fewer overtones. What does that mean for sound quality? This basically translates into a brighter, “pingy” sound with clear tones. Combined with a versatile D minor tuning, this instrument was probably the best for playing along with strictly tuned instruments. However, on its own, the sound wasn’t the fullest. There’s always a trade-off. Clear tones great for accompaniment. Lacking depth from overtones when played solo. The last hang drum on our list also happened to be the most expensive. Let’s see how it stacks up. The first thing we had to notice when we pulled it out of its packing crate was its ultra-slick case. This wheeled and pressure-adjusted case was the only hardshell case we encountered, and it makes a big difference to durability, especially for a musician on the road. 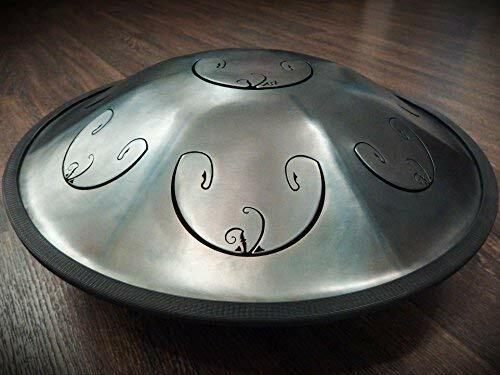 Opening it up, the Tzevaot handpan has eight tone areas surrounding the ding, and is nitrided to protect against corrosion. Tuned to the Aeolian (or natural minor scale), we found this instrument to have a very interesting, dark sound. The tones are generally deeper than the others we tried, and overall it plays quieter. Altogether, the sound is soft and very pleasant, though we would have to say it lacks the ringing overtones we found in some of the other pans. While it plays nicely and with great response, it’s not exactly a sound that would fill up the room. But for a quiet, meditative space, it might be just the thing. Hands-down the best travel case. Dark yet warm scale for great atmosphere. When, as a young, poor musician, I found a leaky old beer keg in the park, I did what anyone would do I tried to make it into a steel pan! After hammering in and out for weeks, I had to accept that I was not getting the right sounds. At some point, I also realized that the thing was made from aluminum! You want an instrument made from quality steel, and that means 2mm thickness or more. 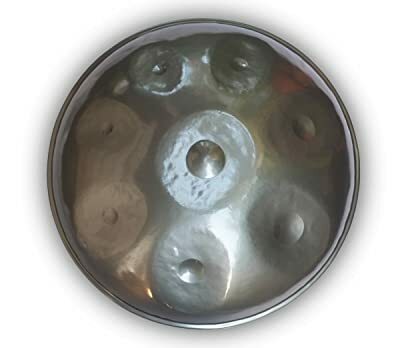 Anything thinner will simply lack the resonant ringing that defines a hang drum. It might even dent and warp as you play. Pro tip: The surface of your instrument also has to be taken care of. This generally means light oiling from time to time, and at least a wipe-down after a long session to keep the sweat on your hands from rusting the instrument. 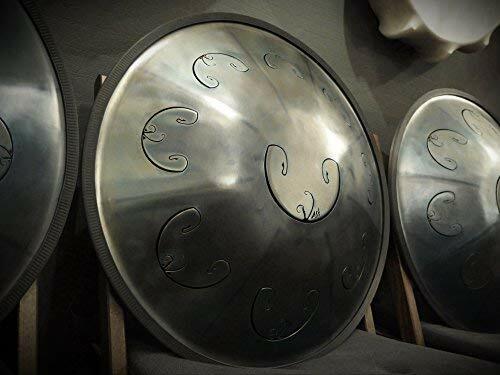 A hang drum is made of 2 steel domes glued together where they meet. The top dome is hammered into tone areas around a central mound called the ding. The ding should be the deepest and loudest note on your hang drum and should have the most overtones. Pro tip: Strike the ding with different weight and see how it rings. If you love it, keep investigating. If you don’t fall in love with the sound, this hang drum’s not for you! Around the ding, you’ll find typically 7-8 tone fields, usually alternating so you climb your scale by striking left-right-left-right. These tones areas have small depressions hammered into the center of flattish circles. Striking the depressions should give you the maximum of overtones, while hitting the circles gives a muted sound. Between these flat areas are sloped “shoulders,” which ideally should produce their own moderate overtones. Pro tip: Strike the instrument everywhere. The best hang drum is going to have overtones all over, not just in the centers of the tone fields. In the middle of the bottom dome is the gu, a funnel-shaped hole that helps the whole instrument to resonate with maximum volume. Though normally played sitting on your lap, you can also play the drum vertically and strike the gu for a massive ring. Pro tip: Strike the gu. It should be tuned in complement to the ding and other tones if the whole hang drum is to resonate well. Think about what you’re going to be playing and why, then choose a scale that fits your needs. If you’re going to accompany other instruments, make sure your scale is going to be versatile to be able to play across the tone range of your hang drum. …is the clear winner. Priced affordably, you get real value for money. It looks the part, hand-hammered and rustic, and sounds it too. We love the bright steel sounds, with plenty of overtones all over the instrument. And you can choose your own scale – what could be better? you with a lifetime of intoxicating music.